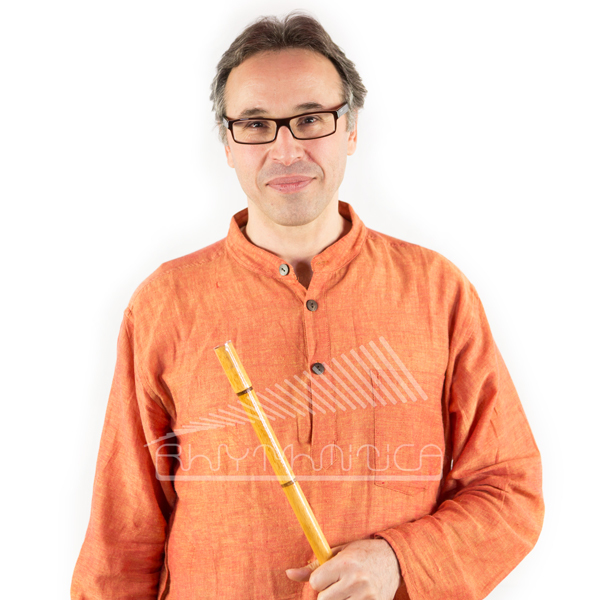 Siamak Jahangiry, Ney player (bamboo flute) and composer, was born in Chaloos, Iran, in 1971. Before his academic achievements at college, he started his artistic career with learning to play Ney under the supervision of Persian traditional music master’s like Mr. Abdolnaghi Afsharnia. He holds his Master’s degree in Music from the college of fine arts in Tehran in 1996. Meanwhile studying academically at college, he continued playing Ney under the supervision of Mr. Mohamad Ali Kiani Nejad. His thesis was about Ney and an analytical research upon Ney playing procedures among former and contemporary players of the instrument. His influential debut mainly as a composer and as a performer in 1993 was the proof of his talent. In the same years, he formed a music ensemble and performed in numerous concerts. Jahangiry composed and recorded music collection pieces called “Feast and Grief” for five Ney and two Tombak. He also recorded two regional music collections on poems and music of northern part of Iran (Mazandaran) and published the “Misty Solitude” Album afterwards. He co-worked with Keyhan Kalhor and team worked with Silk Road ensemble in many concerts which was under the direction of Yo Yo Ma, a master player of violoncello, since 2000. His collaboration with Silk Road resulted in two music CD named “When strangers meet” and “Enchantment” and many extensive concerts and workshops in eminent universities and museums around United Stated, Canada, European and Asian countries. In 2007, Jahangiry followed his profession with Abdolghader Maragheyi’s ensemble which was directed by Mohamad Reza Darvishi and also accompanied with Homayon Shajarian as the vocalist. Recording and publishing three music album with the ensemble was another achievement of him. Other album composed by Jahangiry has been published under the name of “Tanha”, “Negarnine” for the Iranian orchestra and vocal. Another album is named “Dar bande Ney” which is an improvisation and solo of his instrument. In 2015 he has composed a repertory for a quartet to accompany the poets of Simin Behbahani. He has also played all of the Radif repertory of Iranian classical music in 3 CDs which also has been published. Amongst art activates he accomplished, one should mention the numerous honorable concerts with Hossein Alizadeh and Keyhan Kalhor (2010) around the United States and Canada, Performance in Konia Festival with Hosein Alizadeh and Ham Avayan ensemble in 2010, concert with Hosein Alizadeh and Shahram Nazeri (2011), concert with Doosti ensemble directed by Hosein Alizadeh and Shahram Nazeri (2011). Siamak Jahangiry published his latest music album, composed by himself for orchestral Iranian songs and instruments in 2012. As a member of Hossein Alizade group, he has done a numerous concerts in Iran and all over the world since 2010 till now. Actually he is the professor of music in the fine art faculty of Tehran University.